Floodwaters have receded, but most rivers and streams remain above normal levels, and some are still dangerous in many areas. Vermont officials recommend staying away from rivers that are still high and flowing rapidly. You should stay out of all floodwaters because of pollutants or debris. Motorists are still encouraged to stay off roadways as many are unsafe and what roads are open are needed by emergency responders, road crews, and utility crews. Road closures are still too numerous to list. Please call 511 or visit www.511vt.com for updated road closures. The public is asked to NOT call 211 for road closures – those calls are hampering 211’s ability to help those who need shelter or other resources. State Police also ask that you only call 911 if you have an emergency. Before returning to your flooded home, you must have a licensed electrician inspect your electrical system. Wet wiring can cause electrocution. Boil water notices (Bristol), road updates (St. Albans), offers of help (Moretown), and many other postings are coursing through Front Porch Forum tonight as Vermonters deal with the impact of Hurricane Irene… neighbors helping neighbors. The American Red Cross and several municipalities are reaching local folks through FPF as well (see emergency shelter posting below). Dear neighbors – I have a life-size Justin Bieber cardboard cut-out that I’m willing to part with for free. This amazing piece of pop culture ephemera can be yours, or your 10-year-old daughter’s or son’s, with just a quick couple of keystrokes. This gem would also be perfect in the living room in a college house, right next to the beer pong table. Don’t delay; act now. The first of 9 American Red Cross shelters in Vermont opened last evening in Brattleboro, sheltering 17 residents from a local senior housing complex. An additional 20 residents from another Brattleboro Housing Authority location are expected to arrive at the Brattleboro shelter this morning. The balance of the Red Cross shelters opened this morning at 9am. In addition to the 9 shelters being operated by the Vermont & the New Hampshire Valley American Red Cross, logistical support in the form of cots and blankets have been requested by 6 additional communities. Those supplies were provided yesterday or are currently on route. Enosburg Falls, VT – Enosburg Falls High School, 65 Dickenson Avenue. In addition to Red Cross-operated shelters, a number of communities have opened shelters on their own. By calling Vermont 211, folks can find out about shelters in their area. As the storm’s impact becomes further defined, an assessment will be made as to resources that need to be shifted to different locations or consolidated in shelter locations that are experiencing the greatest demand. These shelters are part of a network of over 300 locations across the region with whom the Vermont & the New Hampshire Valley American Red Cross has agreements for potential use during times of disaster. At the shelters opened today, the Red Cross will have the capacity to shelter and feed those that may be displaced by the storm. Hello Neighbors: Thanks to everyone who responded to our request to borrow kid-sized pfd’s for our grandkids’ visit later this month. We’ve found what we needed! Bristol is such a great town and Front Porch Forum is a wonderful to connect with neighbors. Thanks again! Marketers secretly tracking your every move? George Jones, born 200 years ago on this date in Poultney, Vt. was a co-founder of the New York Times. Jones was noted for his honesty, which he, in part, attributed to his Welsh upbringing, especially tested when he, as publisher in the 1870’s, help to bring to light the corruptness of “Boss” Tweed. 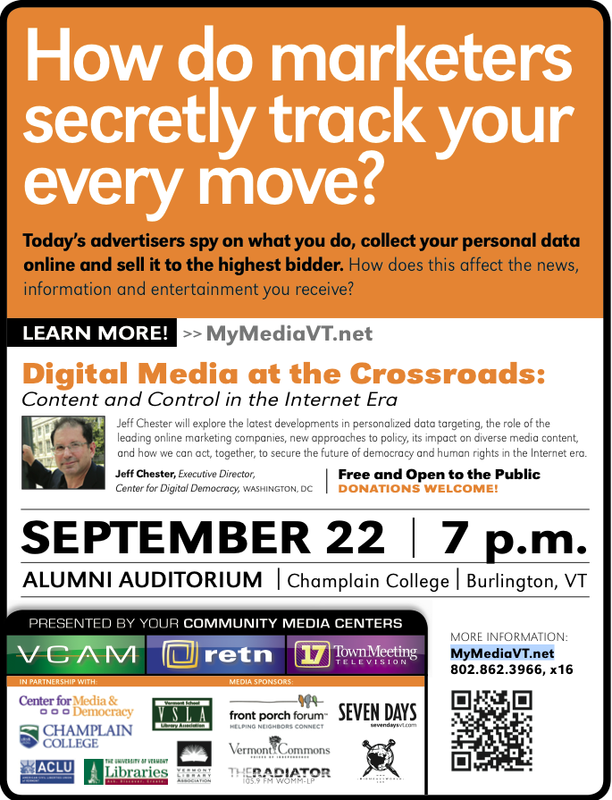 This e-VermontFront Porch Forum “social media special” is provided with thanks to David W. Dunlap of The New York Times. The New York Times of 2011 is in the forefront of the debate/discussion of how a traditional daily newspaper stays relevant in today’s online, immediate access to news reality. Police and Fire Dept. won’t take the job? Neighbors to the rescue! John Dunn & Linda Collins did not hesitate to come to the rescue this evening, after reading a neighbor’s request for assistance on Front Porch Forum. “The response was outstanding,” says Teresa Bobel Mazzarese, who had used the Forum earlier in the day to reach out for ideas and assistance. A cat had become stranded in a tree, in her backyard, at least 60 feet up. John and Linda are experienced rock climbers. Clearly, they are kindhearted neighbors as well. They arrived on the scene around 7 pm. The rescue effort lasted until 8:30. John climbed the tree, thoughtfully calculating every stage of the climb. He then patiently allowed time for the cat to accept him once he had reached her. Meanwhile, Linda secured a pet carrier to the lead for John to hoist up when ready. People want to feel a sense of togetherness. It’s easy to hop aboard a short-term opportunity to feel good. There is nothing to lose. You trade a few hours with a broom for a sense of achievement and togetherness. There is no social or physical risk there. Compare this with the Turkish community in London that banded together and drove the rioters away. The difference, as you can probably guess, is social capital. Not just bridging social capital, but bonding social capital. The London Turkish group feels a strong sense of community. They’re a unique group in a different environment. They have strong social ties. They trusted each other. They came out for each other. If you want people to take a few easy actions, then a good trigger is all you need. Most viral waves that sweep across the internet are built upon a strong trigger. If you want people to band together to do something that’s hard, risky and meaningful, you need social capital. That takes far more time and effort. Know anyone is St. Albans? Please send them to FrontPorchForum.com to sign up! Digital Devices in Public Meetings… Good or Bad? A laptop is what got Essex Town selectboard member Bruce Post in trouble last May, revealing a cultural/digital divide that took several weeks to work out in this bustling town of 20,000 in northern Vermont. … he didn’t think twice when he brought his laptop to a selectboard work session and then took it into the actual meeting that followed to take more notes. But that prompted an onlooker to question the propriety of having the laptop open during the meeting, and in a “point of order” discussion, Board Chairwoman Linda Myers ruled that using the laptop violated board rules on digital devices — though in fact the rule only applied to handheld devices. … five members of the Burlington City Council now “live tweet” when the city council meets (fully a third of the council), says Ed Adrian, a Democrat who represents Ward I. “I think people have been really supportive for the most part,” says Adrian, who works as an attorney with the Vermont Secretary of State’s office. With people having busy lives, tweets are a way for him to inform his constituents, most of whom can’t make it to evening meetings. He says the biggest digital impact on city government in Burlington, though, is the use of the social media/email newsletter, Front Porch Forum. Founded by Michael Wood-Lewis and his wife Valerie in Burlington in 2006, it now is available in more than 60 Vermont towns… and 28,000 members, says Wood-Lewis. He has definitely seen an increase in local officials using FPF to communicate, noting there are now more than 450 members counted as local officials, and probably a lot more who don’t list their official titles. He guesses perhaps half of the forums now feature postings of meeting agendas and town announcements — sort of a virtual country store poster wall. While services like Twitter and FPF are clearly beneficial in passing along town information, they raise some gray areas. During a vibrant discussion last mud season on FPF about rough road conditions in the town of Calais, selectboard members wondered whether to get involved in responding, and whether if they did, they were speaking for the town or themselves? Wood-Lewis says FPF is good for distributing information and for asking questions or prompting discussion but thinks “it’s not ideal for trying to resolve challenging local issues, “ which should be done in face-to-face meetings.